I’m a fan of holiday stories and I’m a fan of this publisher o I soon jumped at the chance of having this collection of LGBT shorts on my hands. I have to say some titles worked better than others but it still was a pleasurable reading. I was waiting for new works from this author since I read Lunch With The Do-Nothings At The Tammy Dinette on January and I was so happy to meet Marcus again here in this short. Marcusa has moved to Georgia six months ago, he’s now working at the Tammy Dinette. He got new friends, new job and a new lover, Hank, the hot mechanic. Since I adored the novel, I was over the moon the author filled my wish to know more about Marcus and his new life. I found them ready to spend their first Christmas together, but most of all, ready to take baby steps toward a real future side by side. And a little misunderstang added more spice to the plot. I loved it! this is not the first story I read by this author and although I was able to see her amazing writing style, I didn’t loved Shelved as I loved the other books Lynn wrote. Maybe cause there is a “double story”, one with a ff couple and one with a MM couple. And I would have preferred to have just Wes and Tony romance, simply cause I’m more interested in mature MCs. That said, I liked this short story and the amazing people and athmosphere the author created. This was the first time I read this author’s work and it was a surprise. To be honest, I’m actually not sure why, cause the writing was really good and intriguing, but I soon at troubles with the reading and I found myself pretty bored, I didn’t understand where the author was going to lead Jack. I was hoping something was going to happened and the story to take a new energy. And then I got an answer, and everything fell into the right place. It gave me hope and faith. A touching short about love and grief. I like the author writing and I was expecting this to be a FF story, it didn’t go exactly how I was hoping and fearing, the usual fake boyfriend clichè was ignored and the plot went versus the friends to lovers theme. I liked how both girls slowly approached each other after years of being apart. And I adored the ending, the promise of a plan to actually be together, gave the short some reality. This short warmed my heart, if you are a dog lover, you can’t not like it and cheer for Avery to come out of her shell and open her life to Grace and to the world. I hoped for her to find some happiness and joy in the arms of a beautiful woman and in the sweet Rudy. The cover art by CB Messer is adorable. This entry was posted in Book Reviews, Books, Contemporary fiction, eBooks, LGBTQ Book Reviews, M/M Book Reviews, M/M Contemporary Fiction, M/M Fiction, m/m holiday stories, M/M Romance, Uncategorized and tagged A Stella Review: If the Fates Allow Holiday Anthology, author Erin Finnegan, author Killian B. Brewer, author Lilah Suzanne, author Lynn Charles, author Pene Henson, Gracious Living Magazine Says It Has to Be a Live Tree by Killian B. Brewer, Halfway Home by Lilah Suzanne, IIf the Fates Allow: A Holiday Anthology, Interlude Press, Last Call at the Casa Blanca Bar & Grille by Erin Finnegan, Shelved by Lynn Charles, True North by Pene Henson. Scattered Thoughts and Rogue Words is happy to host the tour for If the Fates Allow: A Holiday Anthology from Interlude Press. If you love holiday stories, check out all the wonderful stories the authors have for you below, read the excerpts and don’t forget to enter the giveaway at the bottom of the post! Libraries are honored and respected institutions in our communities. From providing free literature for pleasure and information, to offering quiet work space and free Wi-Fi, a town’s library can be a sanctuary for anyone who wants or needs it. In large metropolitan libraries, resources can seem limitless: musical scores; complete medical encyclopedia; drawers of historical maps; comic books; movies; books stretching in themes from fundamentalist Christianity to Paganism, from science fiction to horror to westerns to bodice ripping romance. Meeting rooms are available for community businesses, children have their own spaces where they can read, learn and engage their creativity. Some have cafes, most hold free classes for computer usage, job and careers, adult learning, or business and finance. The options seem as endless as the available materials. And their focus is on the entire community: young and old, rich and poor, all races, nationalities, sexual orientations and religions. The Library Bill of Rights—yes, it’s a thing—requires it. It states that libraries should provide services for all people, present all points of view, challenge censorship, honor privacy of inquiry, and make the library and its full facilities available to all. What happens, however, if you live in a smaller town, a conservative town? What happens when the administration who runs your library carries strong opinions about certain sectors of their own community? When they refuse to post a Pride display in June, or a collection of books celebrating Ramadan or Diwali? When even finding such books in circulation is difficult or downright impossible? In “Shelved,” my short romance in the holiday anthology, If the Fates Allow, the story is told by Karina Ness, a library clerk who works in such a library. She has made it part of her mission at this small county library to diversify the catalog, to expand the offerings for her community who aren’t all white, straight, Protestant folk. She, and her new patron friend Wes, talk about the challenges of getting proper library materials when you’re not like “everyone else” in your community. Which brings up another concern. Kids and teens want to see themselves in books—queer heroes fighting for a cause, boys who fall in love with boys, girls who think the girl in her math class is so incredibly hot, trans or enby kids who struggle to find their identity in our binary world. They don’t dare buy the books at the Scholastic Book Fair, or use allowance money to get them at the closest book store. Without a supportive family, bringing materials like that into their homes can be dangerous. Libraries are a safe haven to read, to steal away, to allow their imaginations run wild and to see themselves as their hero in their own story. And for kids in small towns, the haven isn’t as available if the books aren’t there. In my story, having those types of books available might have made a huge difference to Karina’s Uncle Tony, who didn’t come to terms with his bisexuality until his 40s. But it’s not hopeless. Karina Ness might be a fictional character, but she is in every town. Clerks and librarians like her regularly annoy acquisitions managers, some of whom would rather fill the shelves with Christian romance novels, and speak up for kids like Karina by doing what they can to get the materials in the hands of the readers who need them. When I worked at my small county library, even though our situation was much like what I’ve just mentioned, I quickly learned that if you request a book to be added to the circulation, a librarian will do their best to get it for you. Go equipped with titles or themes and talk to the people on the floor. If one person doesn’t seem helpful—or if she’s your Sunday School teacher or your next-door neighbor and you just cannot ask her—find someone else. If face to face isn’t something you’re comfortable with, even the smallest libraries have an online presence where you can make requests via email or an online form. I have never had a request rejected on premise of theme, character nationality, race, religion or sexual orientation. If the administration of that library isn’t interested in diversifying its circulation, then help them out by letting them know that their community wants it. Your on-the-floor librarian should be glad to help you. If not, ask another. Characters like Karina are on staff all over the country. Libraries, big and small, are truly for everyone. Lynn Charles is an author of queer contemporary romance novels. She lives in Central Ohio with her husband and daughter where a blind dog and his guardian cat rule the roost. She holds a bachelor’s degree in music education, worked at her county library, and absolutely never judged you for what books you checked out. Her novels Chef’s Table (2014), Black Dust (2016)—a finalist for the Foreword Review Indie Award in Romance, and Beneath the Stars (2017), can be found at Interlude Press, and most online book retailers. Keep up with Lynn at lynncharles.net. “Big doesn’t even begin to describe it. I can’t count how many plates I fixed today.” Marcus concentrated on Hank’s backside, which was accented by worn spots on his tight blue jeans, as it bounced up the stairs ahead of him. The sight of Hank’s firm body inches away and the scents of food wafting from the apartment set Marcus’s two hungers warring inside him. As he clomped upward, a loud rumble from his stomach signaled which desire would win this time. “Was that your stomach?” Hank paused on the stairs and turned to shoot Marcus a concerned look. The table was covered with a russet tablecloth and had orange tapers burning in the center of a spray of autumn leaves and berries. Two plates sat on brown placemats embroidered with yellow leaves that Marcus recognized from Helen’s kitchen table. He was sure the tablecloth, napkins, and centerpiece belonged to the Do-Nothings as well. Taking a seat at the Casa Blanca was like stepping out of a time capsule in Morocco circa 1941, by way of Hollywood. Located on the ground floor of an aging hotel, it greeted patrons with the sound of big band music on the stereo and framed photos of Humphrey Bogart and Ingrid Bergman on the walls. Cast on crimson and gold accents, the warm, dim lighting suggested a permanent midnight. A comfortable oddity compared to its five-star competition up the hill, the Casa Blanca’s style was part homage to the classic film, part tequila bar. The owner insisted on a sense of classic style— no jeans or T-shirts for its bartenders, who wore crisp, white dress shirts and black slacks, though he capitulated on the bow ties when the bartenders rose up against wearing the constrictive neck ware. Admittedly, the Casa Blanca hadn’t always been Jack’s idea of a great bar. It had been an acquired taste, born of devotion and a willingness to follow. To some, it came across as fashionably ironic: Kasbah décor-meets-Mexican restaurant to a soundtrack from the American songbook. Jack would protest that it was a hipster joint, would try to default to something fashionably modern atop Bunker Hill, an elegant spot with a view, but the Casa Blanca’s quirks and contradictions grew on him over time. Like a fungus, he would say. Like love, he would be admonished. Maybe it became so much a part of his routine because it was where they had spent many of their best moments together, and a few of their worst. The Casa Blanca was a habit born out of a relationship, a routine that died of unnatural causes one year ago. Rattan fans swirled overhead, casting erratic shadows across the depths of the near-empty room. Televisions at opposite ends of the bar echoed the play-by-play of ESPN in hushed and reverent tones; the voice of the broadcast team usurped by Peggy Lee. At the far corner, his back to the entrance, a solitary bartender wiped glasses while glancing at the game. “That’s all right,” Jack said. He made himself comfortable at a table a few feet from the bar and adjusted his chair to face the television. It might not have been sociable, but he wasn’t here for conversation. Jack glanced at the bartender’s hands without looking up—the prominent veins hinted at athleticism and the nails were buffed to a soft sheen. He drank beer at games, but beer was a drink for the sociable, to be consumed among friends. Whiskey had an appropriately solitary feel, but seemed out of place for a warm evening. “Huh. Someone did more than fix my résumé, I see.” The smile he’d been visibly fighting this entire conversation finally broke free. “It’s these custard-filled pastry… pie… things, and they take forever and a day, and he destroys his kitchen and my waistline. He shoves them off on his clients because—” She stopped rambling. Wes was laughing, and they’d driven right by her house. She directed him around the block. This entry was posted in Book Giveaways, Book Reviews, Book Tours and Contests, Books, Contemporary fiction, eBooks, LGBTQ Book Reviews, M/M Book Reviews, M/M Contemporary Fiction, M/M Fiction, m/m holiday stories, M/M Romance, Uncategorized and tagged author Killian B. Brewer, author Lilah Suzanne, author Lynn Charles, author Pene Henson, Erin Finnegan, Gracious Living Magazine Says It Has to Be a Live Tree by Killian B. Brewer, Halfway Home by Lilah Suzanne, IIf the Fates Allow: A Holiday Anthology, Interlude Press, Last Call at the Casa Blanca Bar & Grille by Erin Finnegan, Shelved by Lynn Charles, True North by Pene Henson. Oh the joy of reading Beneath the Stars! It filled my heart with so many feelings, it was impossible not to love it. I had already appreciated Lynn Charles in Black Dust, that’s why I was curious about this new release. I loved everything in this novel. Let’s start with the characters. Eddie and Sid are simply beautiful people and together they are awesome. Both of them are real, their stories are real, messy, sad, like ours are. I soon emphasized with them and their struggle, I wanted to hug them from the start till the ending. Then there is Adrian, a force of nature, a little boy who has just lost his mum, a great woman. He simply took my heart. He is probably too smart for his age but his cuteness was the icing on the cake for reader like me who love books with children in the plot. And all the secondary characters are well done too, all of them positive, all of them well depicted. The romance part was balanced with all the rest that was happening in Eddie and Sid’s lives when they met and knew something was going to be born between them. In a story like this, the author did a great work with a story believable and a brilliant writing that made the reading fly easily and dialogues engaging. In a way this was not an easy book to read, it’s too close to some themes I particularly care for, events I went through, losses I had. And so I cried a lot. But the tears were neutralized by certain emotions and laughs. Beneath The Stars is a winner, the story is strong and solid, I want to highly recommend it. The author has quickly became one of my favorites. The cover art by CB Messer is simply beautiful, this artist is a guarantee of very well done and most of all fitting covers. This entry was posted in 5 star Rating, Books, Contemporary fiction, eBooks, LGBTQ Book Reviews, M/M Book Reviews, M/M Contemporary Fiction, M/M Fiction, M/M Romance and tagged A Stella highly rated story and author, A Stella Review: Beneath the Stars by Lynn Charles, author Lynn Charles, Beneath The Stars by Lynn Charles, Interlude Press. Today Scattered Thoughts and Rogue Words is very lucky to be interviewing Lynn Charles author of Beneath the Stars. Hi Lynn, thank you for agreeing to this interview. Tell us a little about yourself, your background, and your current book. I’m happy to be here! I’m an author, wife and mother living in Central Ohio. I’ve been writing—from lavish journal entries to fictional stories—most of my life. My novels, Chef’s Table and Black Dust were published with Interlude Press in 2014 and 2016. Beneath the Stars is about man at a major turning point in his career who gets called home to help take care of his elderly father. While there he meets someone, and together, they learn how to define happiness, home and family. What genres do you enjoy writing in? Contemporary romance has always been where my mind takes me when I’m writing. Interestingly enough, while I enjoy reading the same genre, my favorite reads are typically memoirs. But, I suppose there is an interconnectedness in that I like the real and relatable bits of contemporary romance the most of all. Sure, the fantastical is great—be in incredible careers or perfect bodies, the promise of happy endings and deep seeded contentment—but the bits where I can recognize the humanity in the midst of the fantastical appeals to me. Getting the layers of my main character, Sid, out there without pages of info dump. He has a rich background and a complicated present. I over did it, then under did it and threw my hands up in the air a few times with it all. But, I pressed on and Sid will hopefully be a beloved character—he is to me anyway. What did you enjoy most about writing your book? The one-on-one relationships, even beyond the romantic relationship of Sid and Eddie. I loved moments with Sid and his father. Sid and Eddie’s son, Adrian. Adrian and his dad, Eddie, were painful and rewarding as an author. Sid and his sister have a complicated relationship, and exploring that was a joy. The same I see in all of the arts: it broadens not only the viewpoint of the author (or it should), but also the reader. It takes you to worlds you would have never explored on your own, or deepens your understanding of the worlds you have explored. The saying, “Write what you know,” is such a disservice for the author, when there is so much out there we don’t know, and even more we can learn from the places in life that we’re comfortable. My favorite saying in general is, “Just because you can, doesn’t mean you should,” but I’m not sure that’s anything more than a neutral/kind way of considering decisions. I’d probably choose the Dalai Lama quote I use for the signature on my personal email account: Be kind whenever possible. It is always possible. It’s not one I always remember, but I certainly try. Sid Marneaux puts his fashion career on the line when he returns home to care for his ailing father. When he meets the new fire chief Eddie Garner, their romance sparks hot, but Eddie harbors burdens of his own. Through the wisdom of a child and the connection of mothers-now-gone, the men redefine family, career, and most importantly, love. Happiness doesn’t always come easily; sometimes you have to work for it. Sid began with a prepared answer, the one he used for old neighbors and family acquaintances. “He’s doing okay. Day to day, you know,” but when he stopped fidgeting with his food and looked into Eddie’s eyes, his breath caught in his throat. Eddie wasn’t making small talk, wasn’t being generically kind. He was tuned in, with an understanding and patience at peeling away the complicated layers of caring for an elderly parent that went beyond what Sid had felt from anyone—even his closest friends. And so, with Eddie’s unrushed attention, Sid began to unpack the emotions and frustrations he hadn’t yet allowed himself to express. He talked about Anna’s overbearing control and her lack of understanding as to why that would make Lou lash out and became belligerent. He talked about Anna’s calendars and charts and the daily schedule she kept Lou on. About her refusal to let their dad do much of anything. “It’s like she’s already put him in the ground,” he finally said, feeling almost winded after exposing so much of himself, of his family. BENEATH THE STARS will be published by Interlude Press on February 16, 2017. Lynn Charles’ love of writing dates to her childhood where thoughts, dreams, frustrations, and joys poured onto the pages of journals and diaries. She lives in Central Ohio with her husband and adult children where a blind dog and his guardian cat rule the roost. When she’s not writing, Lynn can be found planning a trip to New York or strolling its streets daydreaming about retirement. Her previous novels include Chef’s Table (2014) and Black Dust (2016). Connect with the author at lynncharles.net, on Twitter @lynncharlesnet and on Facebook at facebook.com/lynncharles.net. This entry was posted in Book Giveaways, Book Reviews, Book Tours and Contests, Books, Contemporary fiction, eBooks, LGBTQ Book Reviews, M/M Book Reviews, M/M Contemporary Fiction, M/M Fiction, M/M Romance, Uncategorized and tagged @lynncharlesnet, author Lynn Charles, Beneath The Stars by Lynn Charles, Interlude Press. No matter how busy he keeps himself, successful Broadway musician Tobias Spence can’t outrun the memory of a tragic car crash from his past that claimed a friend’s life and permanently injured his former boyfriend, Emmett. Even after losing Tobias, Emmett Henderson made peace with that awful night, living in his Indiana hometown where he has become a revered choral director. When his students are asked to perform in New York City, he decides to chance reconnecting with his former love, if for no other reason than to get a proper goodbye. When Emmett and Tobias finally meet 15 years after parting ways, it is clear to both of them that their feelings for each other have not changed. As they explore their renewed relationship, the two men face old hurts and the new challenges of a long-distance romance. Will Tobias lose his second chance at love to the ghosts he can’t seem to put to rest? 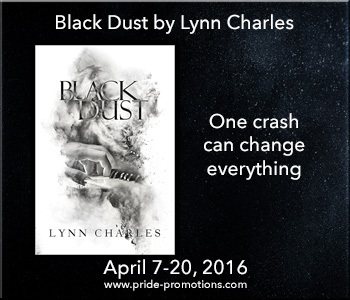 Black Dust is my frst book by Lynn Charles, I was curious and excited to read it. Now I can say I’m surely going to read her debut novel, Chef’s Table, in the coming weeks. What I soon appreciated was the prologue. I adore authors who give me the basical facts at the start and don’t let me beg for crumbs of past events. In the prologue set in the 2000 Emmett and Toby are a young but solid couple, they met two years ago during the auditions at the local theater when they were just 16 and 18 years old. It’s the night before Emmett prom and they are going out with their best friend, Scott when they have a terrible car accident and Scott dies. Fifteen years later Tobias is a Broadway musician, he plays piano all over the world. He left Indiana and Emmett behind. He came back to his life, but the struggle to forget what happened and the dreams shared with his lover forgotten, is still strong and the youthful, broken promises hard to forget. Now his home base is NY and his best friend Malik, a sculptor. Emmett is living in Indiana, working now as a choral director. As soon as the chance of a couple of days in NY come out, he hopeful and calls Toby, asking for a reconnection. Among the two, Emmett was my favorite character, he’s strong, real, loyal and beautiful in his heart. I soon felt a connection with his attitude, in his everyday life, his relationships with his parents or with his students. Yes I fell for him. Point is I haven’t fallen for Toby, at all. And this is the only reason I’m not giving the story five stars. I couldn’t feel his emotions, I found him to be cold-hearted and stiff in everything he does. To me he didn’t stand out as a good person and was almost impossible to me to see him with Emmett. I said almost because at the end, thanks to the author abilities, I was finally able to understand his loss, his guilt and the tragedy he is still trying to overcome. Hats off to Lynn for this and for giving Scott an importance and lovable portrait, I missed him like Emmett and Toby did. The author put in the story her whole musical knowledge and beyond. The MCs’ passion and work had a huge role in the book, but it never overwhelmed my reading, on the contrary, with the help of a well developed and interesting secondary characters cast, gave the plot a foundation and realism needed. I liked the style and the writing a lot, I think she did really great. The “second chance at love” stories are one of my favorite trope in the mm genre and Black Dust greatly delivered. The book was definitely worth my time and I recommend it. The book and cover design by CB Messer is a winner. I like it a lot, an amazing style. It’s one of the reason why I picked the novel. This entry was posted in Book Reviews, Books, Contemporary fiction, eBooks, M/M Book Reviews, M/M Contemporary Fiction, M/M Fiction, M/M Romance and tagged a second chance at love m/m story, A Stella Recommended Story, A Stella Review, author Lynn Charles, Black Dust by Lynn Charles, gay fiction, Interlude Press, lovers reunited. Today Scattered Thoughts and Rogue Words is very lucky to be interviewing Lynn Charles author of Black Dust. Hi Lynn, thank you for agreeing to this interview. Tell us a little about yourself, your background, and your current book. I’m happy to be here! I’m an author, wife and mother living in Central Ohio. I’ve been writing—from lavish journal entries to fictional stories—most of my life. My first novel, Chef’s Table, was published in December 2014 with Interlude Press. Black Dust is about a couple who, fifteen years after a tragic car accident tore them apart, are given a second chance to heal and to love. When did you write your first story/book? How old were you? I honestly can’t tell you when I wrote my first ever story, but I didn’t realize I could write compelling stories until I was in my thirties. I had always had an interest in creative writing and was an avid journaler, but the bug didn’t bite me until adulthood. I am a pantsing plotter? That sounds like I’m out of breath. I like to have some idea where I’m going, but I’m usually pretty free to let the story take me places as well. I am learning in transitioning from writing “stories” to writing books to be more intentional with each scene. What is supposed to happen here? How does it contribute to the movement of the plot? It can’t just be a cute scene because it’s fun to play with the characters. What do you think makes your book stand out from the crowd? I tend to write stories about people who have much of life pretty settled. Mature love, so to speak. Now, their settled life might get upended, or they may realized that “settled” means they’ve let something go they should reach for again, but the men in my stories are grown. Adults. And saying that is not to disparage the younger protagonists that frequent romance novels, because god knows I love to read them too. There is plenty of room in the inn. Here’s where being a bit older than some of my fellow novelists is an advantage: my children are grown. I am fortunate enough that I was able to quit what was even a part time job to focus more on my writing (and to avoid a working situation that was making me battier than usual). I also have an incredibly supportive husband that says, “Get to it,” when I have fallen behind and need to dip into evening hours to get something done. My creative brain seems to kick in in the afternoon hours, so I use mornings to do the chores of life and work, and the afternoon and evening to write. Recently I have been reading books by Indian and Bengali authors as my next book has a Bengali-American protagonist. Generally speaking, I love books with interesting characters. I think I could read a book that’s light on plot so long as the people driving the story have something to say, and they say it in compelling ways. With that in mind, I will always be happy to soak in a great memoir. Fifteen years after a tragic car crash claimed a friend’s life and permanently injures his then-boyfriend, Broadway musician Tobias Spence reconnects with his former love. As Emmett and Tobias explore their renewed relationship, the two men face old hurts and the new challenges of a long-distance romance. Will Tobias lose his second chance at love to the ghosts he can’t seem to put to rest? Emmett saw it, then. He saw in the way Toby had almost obsessed over the ridiculous tattoo and Emmett’s scars, as if begging for them to also bring him the powers that Derek had wished upon Emmett’s body those years ago. He saw it in Toby’s insistence that they start all over as if the accident never happened, as if the years of silence weren’t strung between them like a rope and plank bridge connecting two separate lands. Lynn Charles earned her degree in music education and for many years performed and directed choral music. When she’s not writing, she can be found strolling through local farmers markets near her home in Central Ohio in search of ingredients for new recipes. Her novel Chef’s Table was published in 2014 by Interlude Press. Enter to win. Must be 18 years of age or older. This entry was posted in Book Giveaways, Book Reviews, Book Tours and Contests, Books, Contemporary fiction, eBooks, LGBTQ Book Reviews, M/M Book Reviews, M/M Contemporary Fiction, M/M Fiction, M/M Romance, Uncategorized and tagged A Pride Promotions Book Tour and Contest, author Lynn Charles, Black Dust by Lynn Charles, ex lovers reunited, Interlude Press.